Is it humankind’s greatest achievement? 12 billion miles away a tiny spaceship is leaving our Solar System and entering the void of deep space. It is the first human-made object ever to do so. Slowly dying within its heart is a plutonium generator that will beat for perhaps another decade before the lights on Voyager finally go out. But this little craft will travel on for millions of years, carrying a Golden Record bearing recordings and images of life on Earth. In all likelihood Voyager will outlive humanity and all our creations. It could be the only thing to mark our existence. Perhaps some day an alien will find it and wonder. 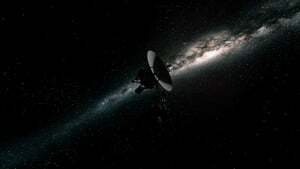 The story of Voyager is an epic of human achievement, personal drama and almost miraculous success. Launched 16 days apart in Autumn 1977, the twin Voyager space probes have defied all the odds, survived countless near misses and almost 40 years later continue to beam revolutionary information across unimaginable distances. With less computing power than a modern hearing aid, they have unlocked the stunning secrets of our Solar System on a journey as revolutionary as the first circumnavigation of the globe and humankind’s first footprint on the moon. In this powerful, poetic and cinematic feature documentary, THE FARTHEST celebrates these magnificent machines, the men and women who built them and the vision that propelled them farther than anyone could ever have hoped. Launched from a fractious planet, these pioneers sail on serenely in the darkness – an enduring testament to the ingenuity of humankind and the untapped limits of the human imagination. Passionate organic storytelling with people, images, archive and opinion woven with daring and brio makes THE FARTHEST a genuinely cinema-scale adventure.